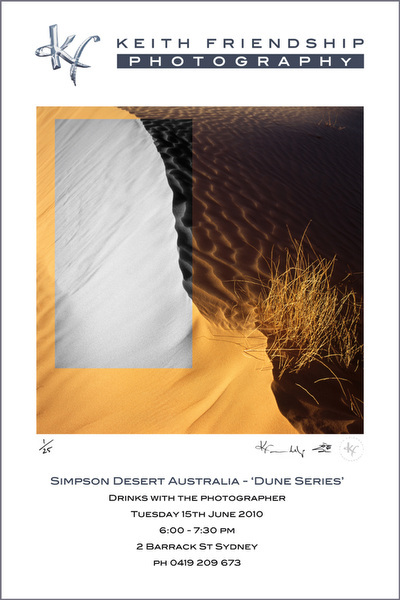 Keith Friendship’s ‘Dune Series’ transports us into the forbidding landscape of Australia’s heat-scarred interior. In 2006 Keith set off with a mate, a sturdy 4WD and his camera gear on the adventure of a lifetime – to cross the vast expanse of sand which is the Simpson Desert. The stark, awe-inspiring detail of this unique landscape captured his imagination and resulted in this extraordinary series of photographs. Their striking colour and composition encapsulate the essence of one of Australia’s driest and most remote areas. All prints are authentic giclee prints made from original photographic digital images captured by Keith Friendship during his travels. To protect your investment in fine art we use acid free, archival paper and pigmented inks that are engineered to last 75 years. Keith Friendship Limited Edition photographic prints are mounted in a premium white or black box frame and are hand signed, embossed and numbered by the photographer. They are printed on a combination of ‘Hahnemuhle’ photorag 308 (black and white print) and hi-gloss (colour print). All are issued with a certificate of authenticity. Keith Friendship Open Edition photographic prints are available in one height size of 30cm with an open edition quantity and are supplied embossed and unframed. The media is gloss smooth (colour / black and white composite print). All prices are inclusive of GST. Postage and handling additional.